If you’re a fly on the wall in my home this month, you’ve come to the right place. It might be 5 degrees outside, but as usual The Man is feeding the woodburning stove like it’s a starving whale, and it’s warm and cozy in here. Like…shorts and tank top warm. So hang out for a while and see what’s happening around here, and then check out the links below to see what’s going on in 14 other bloggers’ homes! 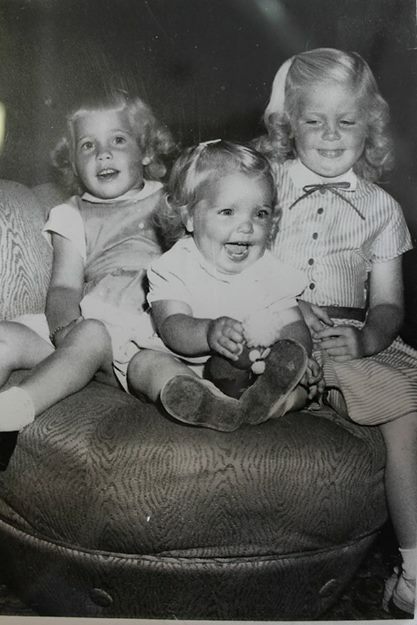 My older sisters came for a visit – a cause for much excitement since my oldest sister Khym hadn’t been here before and I was tickled they were both coming. They drove six hours to get here…which is a pretty big effort! My 60th birthday is coming up in a couple of months, and since no one in their right mind would drive here in the winter, they brought lots of fun little treats to celebrate early. Fun gourmet goodies, crafty stuff, music. Loved it! They also brought SLIDES! You know (or maybe you’re young and don’t know) old-time photographs in little squares of cardboard that are projected on a screen. Or bumpy wall. I could probably write a complete blog on our attempts to make the slide projector work, but in the end we got to see ourselves as children and teenagers. Good times! The running joke was yelling “GET IN MAH BELLEH” in a deep voice every time I popped up on the screen, because I was SO fat. And my wonky eye and big tongue got a whole lot of laughs too. Damn, I was a mess. We had fun with sister Jenny, who is officially known as the “Crazy Chicken Lady” now. We watched videos of her chickens, and laughed at her because she lets one sleep in her bed! Honest, it’s true! And just because we couldn’t resist, while she was out in the dark on our front sidewalk, The Man went behind the house and blew on one of his predator calls. We heard her footsteps running for the porch, and she came skidding into the front door. Now…if you came into the house after hearing something like that and saw your sisters laughing hysterically, wouldn’t you guess you’d been punked? Nope. She was insistent she’d heard something creepy. We laughed ’til we cried, and she finally figured it out. Snort. Jenny also likes ice cream. A lot. Oh, and one more sister story…and this one’s a doozy! They called on their way home, very excited, to tell us they’d seen a moose. In fact, not just one moose, but several. Apparently they were very skinny, but I said that was normal – they weren’t big and fat like cows, more muscle than fat. It didn’t even occur to me to question it, even after they said there was a mama and babies. Kind of the wrong time of year for that. When the picture was posted on Facebook my son took one look at it and started laughing. They’d driven by a place that creates metal sculptures. Skinny??? Um, yeah…like maybe 1/2-inch thick. We all got a kick out of that, even the sisters. Two days later, my son saw a huge bull moose. He described it to me and added “and it wasn’t even cut out of sheet metal”. Speaking of game…last month in my Fly on the Wall post I described the disgusting elk head that was putrifying and stinking to high heaven in our backyard. I complained so vociferously that The Man went out there to cut the remaining dead crud from the skull so he could bleach it to hang in the Man Cave. Unfortunately, he nicked himself with the knife. Do you have any idea how quickly that kind of bacteria turns into blood poisoning? At the speed of light, my friends. After a week of pain, suffering, whining, Urgent Care, and a follow up at our doctor’s office, (and some really impressive peeling of his skin) the red line is gone and The Man is back to normal. The $75 that he was saving by cleaning the skull himself instead of letting the taxidermist do it ended up costing us a hell of a lot more. Shaking my head. Just…………..shaking my head. He wants us to call him “The Legend” now. 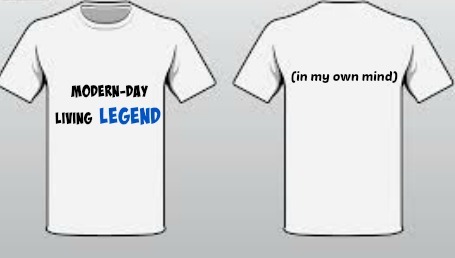 I know his gloating is (sort of) in jest, but I still might have to have a special shirt made for him for Christmas. We all got our deer this year. I’ve decided this is the last time I’ll do it, but we have lots of meat in the freezer…a great feeling. I don’t have any objections to hunting per se; we use every bit of that meat. But I agonize over it when it is me who is doing the dastardly deed, so I’m leaving it up the guys from now on. Still, he was a beauty! My daughter posted this status: “Drinking coffee and swearing at the sewing machine. More like my mama every day, and proud of it! !” Yep. She probably learned more cuss words watching me try to sew than she did from her brothers. And yet…we keep trying. 🙂 Little Mack’s “Oompa Loompa” costume was worth the angst though! I was feeling indulgent, and hit the kitchen on a mission. The resulting pastry was enough to put each of us into a sugar coma. 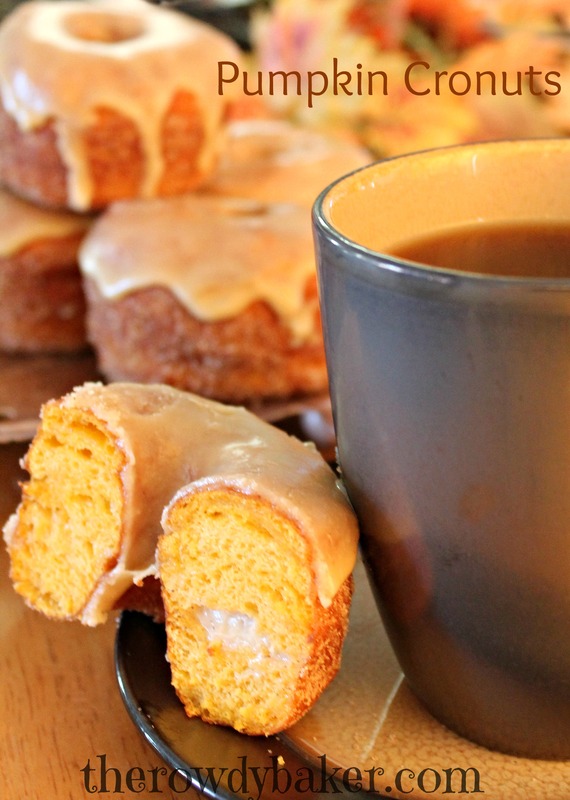 I’m going to let the picture do the talking; the link is here for Pumpkin Cronuts. I started pulling the pillow cases off the pillows. I cannot die. Ever. He wouldn’t survive. No one can question why he’s still single. I spent 6 glorious days visiting “the coast”, which means Seattle. 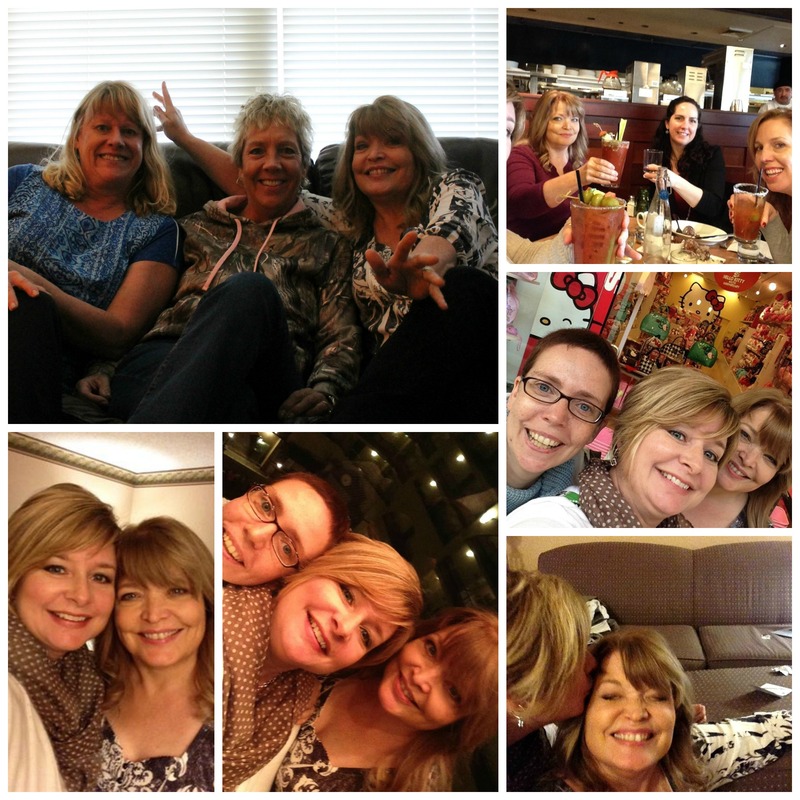 I bounced from house to house freeloading off of friends from my past, and had a blast with 4 bloggers whom I’d never met. Ate too much, drank too much, spent too much, drove too much, and slept too little. All in all, a perfect trip! I’d add some funny stories, but you know….what happens on the coast stays on the coast! Now I think I’m ready to hunker down for the winter! Now buzz over to these great blogs – these ladies are seriously FUNNY! This entry was posted in Fly on the wall and tagged fly on the wall by Lorinda. Bookmark the permalink. OMG…those little ones are just too cute. LOVE LOVE LOVE their costumes!!!! squeee! OMG, the pillowcases not being washed and your reaction…I am truly laughing too hard. I know, huh? I wish we lived close…I’d fill their trick-or-treat bags to the top! And seriously, how can we be married 36 years and the man still doesn’t know that when you wash sheets you wash pillowcases? Thank you so much! I appreciate the visit and the comment! Oh my – I laughed as much as I did when I was there. I’m going to print and send on to Jenny. She’ll love the stories. SO – do you have turkey, elk or venison for Thanksgiving? Cussing and sewing, definitely something I can relate to. LOL But the costume was SOOOO CUTE!!! Somehow I’m guessing (and yes, the name of your blog was a dead giveaway) that you are more adept with a sewing machine than my daughter and I! He was a doll, wasn’t he? 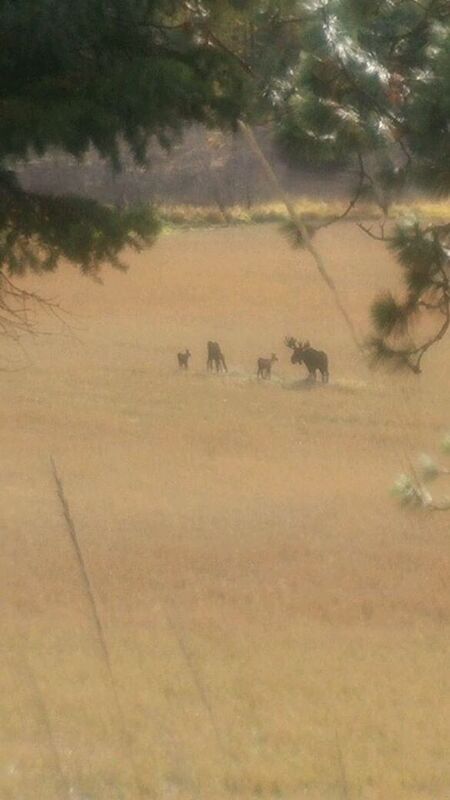 Their Moose sighting cracked me up! Priceless! I am so grateful that the hubs is better and you can snuggle in for a bit of winter weather together, happy and healthy again. Thanks, Meg. Life is good, and I’m honestly looking forward to getting snowed in. Hope the weather obliges. Tons of food, coffee, and books, so I’m ready. Loved it! Look forward to the next one. Our pic didn’t turn out half bad either. 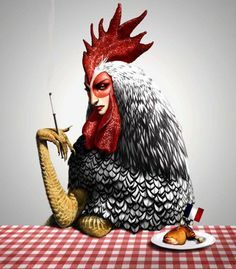 Talk to you this aftetnoon. Looks like you had a year’s worth of fun in one month. 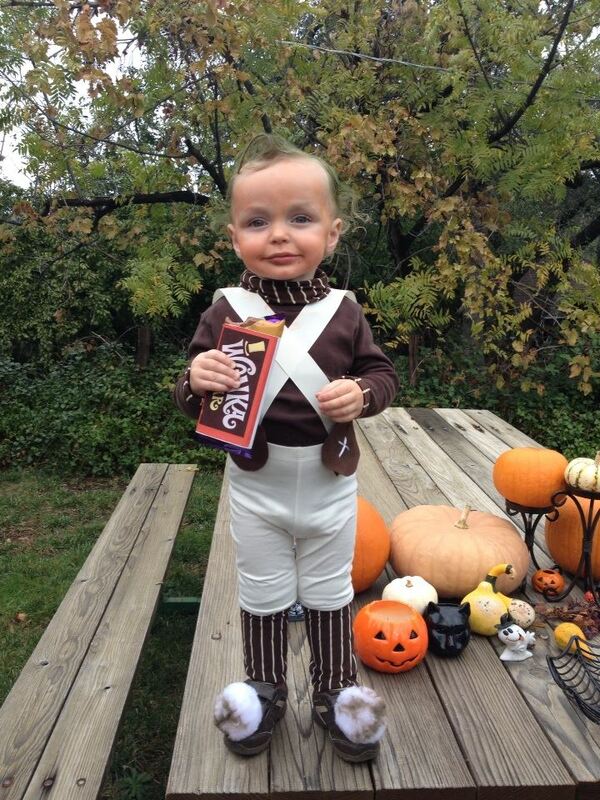 I’m still giggling at your adorable Oompa Loompa. Yep – that fun should last me until next year! The little bugger had so much fun once he understood the goal behind trick-or-treating. He’s a chocolate fiend! You are such a doll! Thanks so much, Nettie! And someday I’d love to come see you – I’ve never been to the East Coast. No long drives in the snow for me…ever again! I think it would have been great to have a brother, but it was also fun being one of “the girls”. love old slides!! My parents would get out the slide projector when we were kids & show us pictures. Looking at pictures on our TV now just isn’t the same as slides! Sounds like a really fun time with family! 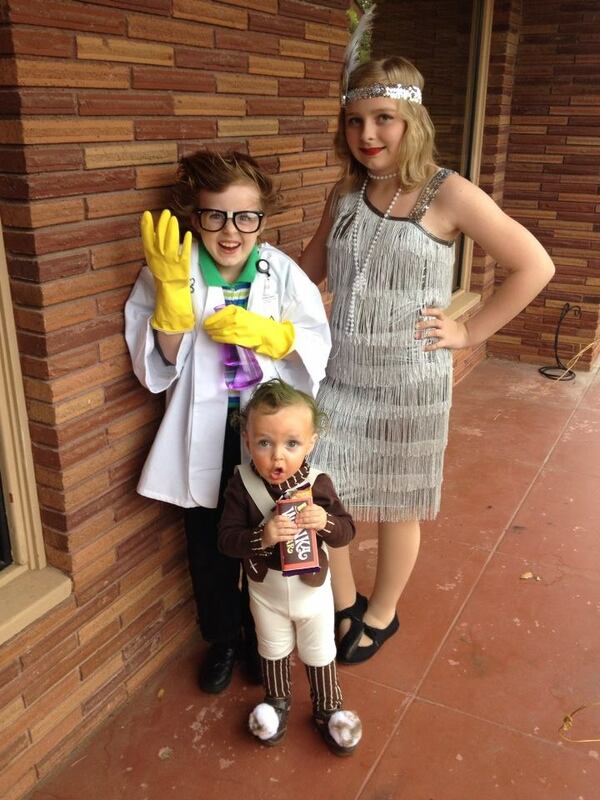 The Willy Wonka costume was ADORABLE! CUTE!! I loved the slides too. It was one of my favorite things to do when we were young. Always so exciting. I have one of those little hand-held slide viewers – not the same, but better than nothing! Love that your sisters were visiting and we could share in the laughs. I used to have chickens and miss them, my “girls”. Thanks, Dawn! The sisters were great, but I’m not so sure of the chickens anymore, now that I’m only getting 2 or 3 eggs a day out of 20 girls 😉 A lot more trouble than they’re worth, but I do love hearing their sweet little chirpy noises. Lorinda, I laughed at so much of this post. SO glad you had such a nice time with your sisters. Laughing with your family is the best. I especially laughed at the metal moose story. That is something I absolutely would do. Glad your living legend is feeling better (whew). Funny Story to tell you just how city-boy my husband is. I showed him the picture of your buck. “Is it a ten?” Impressed, I looked at the picture at counted the points. “Not sure if it’s and 8 point of a ten.” “What? ?” he said. “I asked if it was dead!”. Dear Heavens. Oh, Lord, Michele….now I’m laughing! You have to admit, it does look kind of alive there. (Catch and release?!) He was an 8, by the way. It was hard – my second year in a row, and I’ve already told the guys I’m done. We like the meat but it’s just too hard for me to live with afterwards. Those men. This is what happens when we spoil them…they get clueless about everyday stuff. Ask mine to replace an outside faucet, dig up the septic, build a chicken coop, and he’s all over it. Change sheets? Huh. Sneaky guys. But then…that’s why I’m inept when it comes to mowing the lawn and changing the oil in the car. I’m having trouble dealing with the cuteness of your grandkids. I’ve never tried cronuts. That picture spoke to me. It said…. Try us, you must. Very forceful picture. I’m grateful the Man recovered fully. My man still asks why I want to wash the pillowcases. Every. Single. Time. Do men think pillowcases are immune to dirt?? Cronuts are wonderful, but to be perfectly honest, I prefer a tender glazed doughnut or crispy croissant. I like to create over-the-top sweets, but usually like my simple pleasures.